Wilbur makes an adjustment to the airplane, with Orville looking on. Wilbur Wright arrived in France in May 1908. Over the next year, he made more than 200 flights in Europe, dazzling crowds whenever he took to the air and turning critics into admirers. He became a hero lavished with praise, honored at ceremonial dinners with political leaders and the aeronautical elite, and the recipient of numerous prizes and medals, including the Legion of Honor. 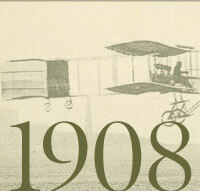 During their European tour, the Wrights flew what became known as the Wright Model A, a refinement of their 1905 Flyer. The Wrights’ European tour continued in Italy. Wilbur trained Italian military pilots, and the first motion picture footage taken from an airplane in flight was filmed there. After completing flight trials for a U.S. Army contract in America in July 1909, Orville briefly returned with Katharine to Europe to demonstrate the airplane and to train pilots in connection with a contract for license-built Wright aircraft in Germany. The airplane, shipped to France before Wilbur’s arrival, was damaged as a result of careless customs inspection. Wilbur spent two stressful months preparing it for flight. Hunaudières racecourse at Le Mans, southwest of Paris, was selected as the flying site. Wilbur made his first flight in Europe on August 8, instantly confirming the Wrights’ claims. Seeking warmer weather, Wilbur moved his flight demonstrations to Pau, a resort town in the south of France, in January 1909. In February and March, he continued to make one spectacular flight after another and trained several students as well. Orville and Katharine joined Wilbur in France after he arrived at Pau.